A few weeks ago, we hosted a hugely popular webinar titled: Dispelling SBIR/STTR Funding Myths and Misconceptions for University-Based Innovations that was led by Geoffrey White, PhD, President of Discovery Consulting, LLC. The program is filled to the brim with excellent information and factoids about each program and garnered high praise from attendees. The question and answer session lasted over 20 minutes and the program continues to draw attention, so I thought it would be a great idea to include a portion of it as this week’s blog post. But, this is just the tip of the iceberg — Dr. White covered over 30 slides worth of information in the program and you can get it all — just CLICK HERE to purchase the recorded session. Read on to see a selection of questions from attendees –some of the answers may surprise you. Dr. White: If you’re going to be a PI for an SBIR, it’s 51 percent employed at the company, and 51 percent is measured by dollars, not time. And the other 49 percent of the time, a person could be employed by a university, or another company, or something else. And sometimes I’ve had people at universities do just that: they leave the university for the course of the SBIR, and they get 51 percent of their salary during that time from the SBIR. And the reason they do that is because they don’t have someone else to go and work at the company, and they need to [fill that role]. Otherwise, you may as well just do an STTR. Dr. White: Absolutely. I’ve gotten lots and lots of funding for doing that. The Phase I is a test of feasibility — in fact, what we did is we basically showed that this new cancer drug that we have is very effective. We showed that in preliminary studies, and then the Phase I studies are just showing some more animal models. And all of Phase II is all the IND enabling studies that one needs to do. And at the end of the Phase II, we’re going to file an IND, and hopefully we’ll use a Phase IIB to pay for the Phase I/II clinical trials. Dr. White: In principle it is. It just depends on the novel screen. It’s going to have to allow you to do something that can’t already be done, and maybe you’ll do it cheaper, maybe you’ll do it a little bit faster. But unless you fit at least that tenfold better [than existing technologies], or it will now allow you to screen against the disease that was previously just impractical to screen against. It’s going to be tough. So I’d have to know more details about that. But in principle, yes, you can do it. Dr. White: That’s a very confusing area. The answer is: yes, they support clinical trials. They do not support Phase III pivotal clinical trials of efficacy. They support Phase I and Phase II trials, which are not for efficacy. That’s the difference. Dr. White: I don’t think it’s a good long-term strategy. In terms of SBIRs — no, that’s really a personal decision. In terms of getting SBIRs, you could do that. I don’t know why you couldn’t do it if the university was willing to do it. Of course, the downside is that if the university is now going to want to share in the IP. You just have to decide how that all works for you and what your comfort level is. Now, they’re doing something for you, you want to do something for them, but how much of it do you want to give up? So you just have to work out those details and see what’s right for you. So in terms of a business strategy, there are a lot of considerations to come up with, and it’s really going to be a personal decision: risk versus reward. SBIR vs STTR: Who has more money available? Dr. White: There’s a lot more money available with SBIRs, and that could be a consideration, but that’s if you look at the scores. Usually SBIRs are a lot more competitive in terms of scores than STTRs, so it’s really not the amount of money, but it’s really the score that’s important. If you’ve got a great project, and you’ve got a great team, and you’ve got a great experimental design, you’re going to get a good score. Also, if you did get a really good score, and for some reason the STTR didn’t get funded, you could always call the program person and say, “Hey, if I turn this into an SBIR, will this be fundable?” And the program people have the right to do that. If they want to, they can let you change it to an SBIR. So they have to agree to do that, but it’s not hard to do. You just have to be able to find a reasonable way to change around where the money is going. If you can find a way to get the right PI in there of equivalent strength, you can change it to an SBIR if you had to. Dr. White: It’s a difficult question. 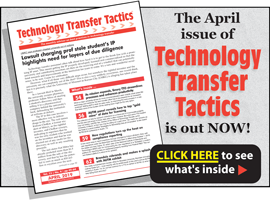 You should certainly be able to go and talk to your tech transfer office and get some good input. A lot of this is pretty straightforward. Go talk to other people who have started companies or gotten SBIRs. You can go and search the NIH reporter and — or the NSF has an equivalent database, and so does the DOD. Find people who have gotten funded in your general area. Call them up. E-mail them. And find people who have gotten funded multiple times, not one time. And chances are they’re going to talk to you and give you the benefit of their experience.But going out and hiring a consultant to learn that stuff is probably not what I would do. CLICK HERE to purchase Dispelling SBIR/STTR Funding Myths and Misconceptions for University-Based Innovations on DVD, On-Demand Video or PDF transcript. We’d like to thank Dr. Geoffrey White for his presentation.